Posted by dissident93 in economics. Many pilots are poorly paid (eg $17,600 gross). Some have second jobs to make ends meet (as well as being overworked as pilots). Some are on food stamps, or donate blood to earn extra cash. The next segment showed US companies (Walmart, AT&T, Citibank, etc) benefiting from deaths of their employees by secretly taking out life insurance on them. This is called “Dead Peasants” insurance by the brokers. An attorney (Michael D. Myers) said the companies “want the employees to die in accordance with the policy projections”. Moore showed a document (from a broker) about a shortfall in deaths (“78% of expected mortality”) which stated that their clients “are acutely aware of this problem”. Who needs satire? Moore didn’t link worker mortality with factors such as long working hours, work-related stress, perceived low status, etc. I guess some things have to be left to the viewer to piece together. There’s a useful, sourced list of studies linking worker mortality to long hours and stress at Media Hell. In a sub-theme, Moore presented (some) Christians as opposing capitalism: a priest says it’s “radically evil”, a bishop blesses protesting workers, etc. Footage of hypnotism was shown to imply that “good Americans” have been hypnotised to believe that capitalism is compatible with Christian beliefs. But Moore didn’t mention the historic links between Protestantism and capitalism, as documented by Max Weber and histories of the industrial revolution. He also didn’t specifically mention the masses of conservative Christians – eg Republican-voters, supporters of the “free-market” – not all well-off or supportive of Major Financial Criminals. So, on one level, the Us-vs-Them theme didn’t work for me, although Moore was probably right to go with it (dry intellectual reasoning makes tedious films). Also, for me, it’s enough to witness the effects of the Financial Criminal System (and Moore shows these effects close-up – people losing their homes, etc) without having a Christian Authority assert that it’s evil. I mean, you can probably find just as many American Christians who will assert that communism, blow-jobs, abortions and welfare are evil (or at least immoral). The excellent section of the film on the $700bn bailout of the US Financial Criminal System implied a conspiracy – Congresswoman Marcy Kaptur described the US Congress’s about-face over the bailout as being arranged “almost like an intelligence operation”; Moore used the term “coup d’état”, etc. 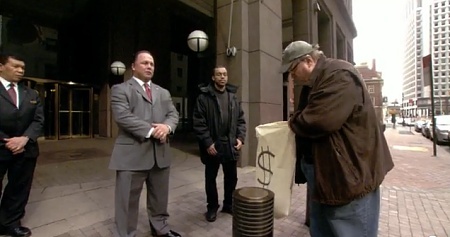 We could do with someone like Michael Moore to give the UK bank-bailout the satirical treatment. There are some dubious and confusing messages (or propaganda) in the UK media. Some media reports estimate that the bank bailout adds around a trillion pounds to the national debt, whereas others (noticeably from the BBC) claim that the bailout had “very little” effect on the debt. If the estimates of around a trillion pounds are correct, that’s equivalent to approximately £40,000 per household (around 25.5 million households). Presumably this is what Harford “sort of” refers to when he says “We as taxpayers have bought lots of shares in banks”. What I’d like to know is when can I cash-in these shares I’ve apparently bought – £40K’s worth – preferably with interest. The bank bailouts are mostly not included and they also have an uncertain cost depending on future share prices. It might be just a couple of hundred pounds per household. What’s a few hundred quid compared to £90,000. Harford’s message seems clear: the bank bailouts amount to virtually nothing; nothing to worry about.